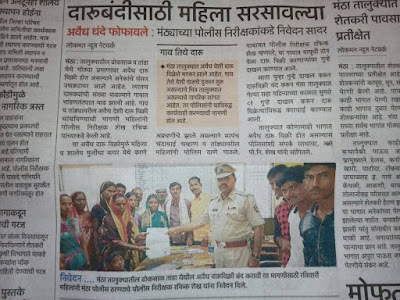 Jalna, 5th July 2017: The women who are the beneficiaries of the project run by Bosco Gramin Vikas Kendra (BGVK) in Dhoksal village stop illicit sale of liquor in their village. It is a village which is 15 kms from Mantha Taluka in Jalna district of Maharashtra. All the women are part of the Self-help Group (SHG) managed by BGVK (a Don Bosco institute) for the last 6 years and were are also part of the rural development project run by BGVK in the 60 villages of the region. Under the able guidance of Mrs. Rekha Shirgole (Project coordinator of BGVK in Jalna) an application was drafted and was submitted to taluka police station. SHG women along with the village Sarpanch took a Morcha (protest) to the police station. The application to ban the liquor was accepted by Sarpanch and immediately action was taken the very next day to stop the liquor sale in the village. The transport facility available in this village is very poor. There is only one bus that comes once in a day to this village. The closest town for their daily needs is 15 km away i.e. Mantha. People have to find their own means of transport to reach this place. There is one Anganwadi and a primary school in the village without secondary school. For the last 8 years, two liquor shops situated on the village roads were causing lot of inconvenience and disturbance in families of the alcoholics. The young girls and women found it extremely difficult to frequent to the schools and colleges due to the harassment from these alcoholics. Several times it was brought to the notice of the elders of the village but it fell on deaf ears. During the meeting of Don Bosco managed SHG the issue was discussed and immediately the action to ban the sale of the liquor in the village was taken. The villagers were very happy at their achievement and expressed their heartfelt thanks to BGVK for constant efforts in making their village a better place to live.